Quick-connect fittings often serve to connect sections of exposed copper water lines. Unlike soldered connectors, quick-connect fittings allow you to replace or reconfigure sections of piping without the need for a torch or pipe cutter. Follow a simple procedure to remove a quick-connector from a water line. 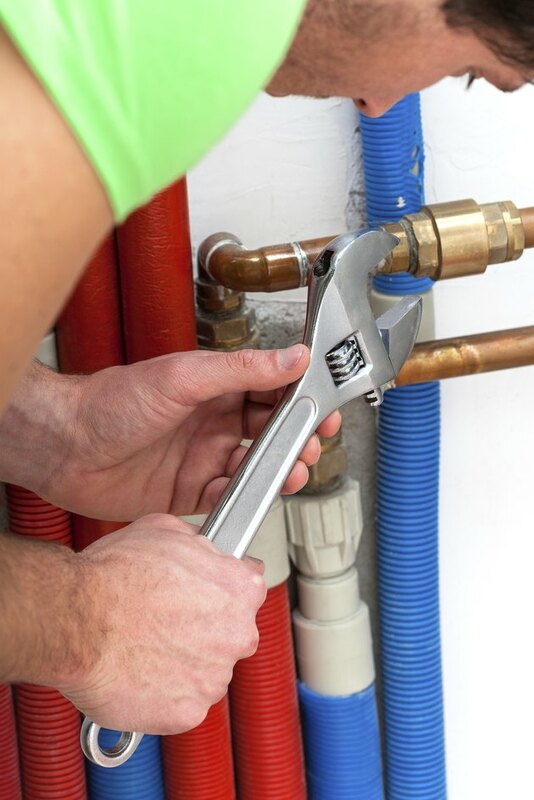 Quick-connect fittings make plumbing jobs easier in confined and hard-to-reach areas. Turn off the main water supply valve to the house. Typically, the valve is located at an outside wall and is closed by turning a circular handle or rotating a lever so it points in the same direction as the main water line. Turn on a garden spigot or a faucet in the house and allow water in the household pipes to drain out. Put on work gloves and locate the quick-connector you want to remove. Hold the section of pipe near the connector firmly with one hand. Grip the connector with your other hand, and using your thumb or forefinger, compress the nylon ring at one end of the connector. Hold pressure on the ring and rotate -- twist -- the pipe back and forth as you pull the end of the pipe out of the connector. Repeat the procedure and remove the connector from the end of the adjoining water line. What Types of Pipes Are Used for Underground Water Supply Lines?